Here we share a direct link to Download Moto X4 Android 9.0 Pie Firmware Update. The Android Pie update for Moto X4 is rolling out via OTA and soon will be available for all. The update brings Pie goodies and brings November security patch for the device. Follow below guide to Download and Install Moto X4 Android 9.0 Pie OTA Update (PPW29.69-26). The PPW29.69-26 update for Moto X4 is an Incremental update which rolls out in phase wise manner. The update is rolling out via OTA (over-the-air) and many users already getting the update. You can wait for the OTA updates, or you can Download Moto X4 Android Pie OTA to update it manually with below method. 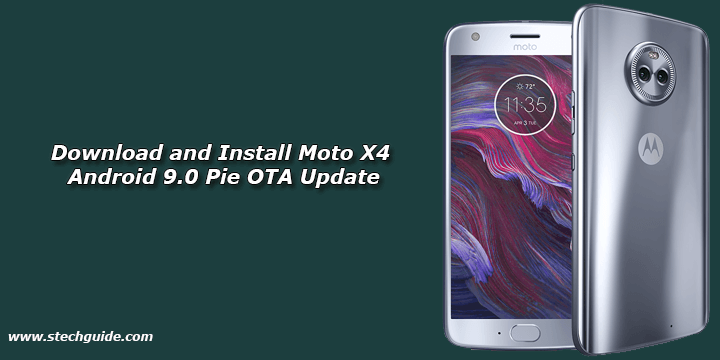 Download and Install Moto X4 Android 9.0 Pie OTA Update PPW29.69-26 from below. We provide you the Moto X4 Android Pie OTA zip which you can flash on your device. You can check for the by go to Settings > About > System Update > and check for update. So if you want to update your Moto X4 to Android Pie then Download Moto X4 Android 9.0 Pie Firmware Update from below. This method only works on Moto X4, don’t try it on other devices. Make sure your device running on latest OPWS27.57-40-25. 1) First Download Moto X4 Pie OTA zip from above and save it to your device. This is the easiest way to Download and Install Moto X4 Android 9.0 Pie OTA Update (PPW29.69-26). Let us know your thoughts about MotoX4 Android 9.0 Pie update in the comments below. Stay connected with us via Facebook, Twitter, and Google Plus to read more such helpful posts.